As you know, Americans love to eat, especially when they travel. But today’s traveler is looking for more than quantity — they want regional specialties, sophisticated selections and appetizing presentations. In short, they want quality cuisine. And cruise lines, once known primarily for bountiful buffets, are increasingly catering to those who eat well at home and want to do so, and then some, while at sea. In addition to injecting their own onboard restaurants with creative flashes and artisanal ingredients, many ships now offer food-focused theme cruises. These special voyages let passengers taste their way through a destination, enjoying fresh lobster on the coast of Maine, smoked salmon in the Pacific Northwest, tapas in Spain and cheeses in France. Many also include a culinary expert — or a famous TV chef! — who will share their knowledge in lectures or even accompany shore excursions. And don’t forget the drinks — several special voyages focus on micro-brews, wine and/or spirits. Many cruise lines offer these special voyages, but here are our picks for seven top food-focused theme cruises. 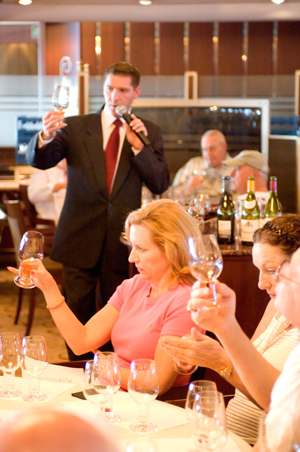 PHOTO: Crystal offers wine tasting on several Wine & Food Festival sailings this year. Crystal Cruises’ Crystal Serenity will feature both fine wines and beer on special theme cruises this year. The trans-Atlantic voyage from London to Boston Sept. 5-19 has a new twist on the line’s Crystal Wine & Food Festival — and that’s golf. Guest chef Thrainn Freyr Vigfússon, one of the most talented chefs in Iceland, will be joined by wine expert David Gordon, the wine director for New York’s Tribeca Grill and the Myriad restaurant group. Also scheduled to sail is mixologist Bridget Albert, the co-author of “Market Fresh Mixology” and winner of numerous awards in cocktail competitions. And if you’re also into golf, Billy Casper will be onboard. Meanwhile, those on the Crystal Serenity’s Nov. 5-19 cruise from New York City to Miami will explore the ever-growing world of craft beer. 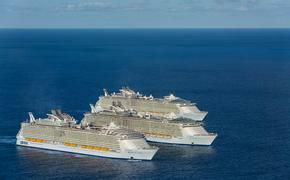 Cruise-only fares start at $4,710 per person. Onboard lecturers will include beer experts Stephen Beaumont and Anthony Caporale. Beaumont is a contributor to eight magazines and dozens of books, including the “The World Atlas of Beer,” as well as operating his own blog, www.worldofbeer.com. Caporale, a certified specialist in spirits in the Society of Wine Educators, is a mixology chef instructor at the Institute of Culinary Education in New York. Of course, good food goes with craft beers. One of the optional food-focused shore excursions ($229) is a blue crab lunch at Bo Brooks restaurant in Baltimore, followed by free time in the Lexington Marketplace. Celebrity Cruises has partnered with Bravo TV to offer a series of four “Top Chef at Sea” cruises starting in July. In all, 13 former “chef’testants” of the Emmy Award-winning series will sail, including past winners Paul Qui, Kristen Kish and Hosea Rosenberg and fan favorites Nina Compton and Chris Crary. The “Top Chef” cruises will include complimentary cooking demonstrations, interactive Quickfire Challenges and other activities. Fares start at $599 per person. The “Top Chef” cruises are scheduled to depart July 27 on Celebrity Summit to Bermuda, Aug. 15 on Celebrity Solstice to Alaska, Sept. 19 on a 12-night “France & Iberian Discovery Cruise” on Celebrity Infinity, and Nov. 15 on Celebrity Reflection to the Caribbean. In addition to these four cruises, Quickfire Challenges and “Top Chef”-inspired menus will be available on all Celebrity ships departing July 2014 to June 2015, with the exception of Celebrity Xpedition. When you cruise the coast of Maine, you should expect to be served lobster. And American Cruise Lines will offer you whole steamed lobster, stuffed lobster, lobster pot pie, lobster risotto, lobster omelets — even lobster ice cream! 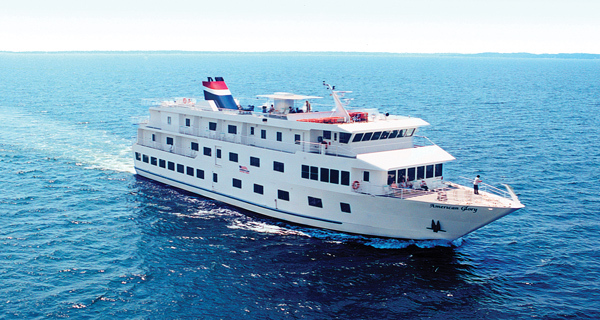 The lobster theme is so popular, it is offered on all of the company’s eight-day Maine Coast cruises departing from early June through September on the 49-passenger American Glory and 104-passenger Independence. Passengers also can go out on the boat of a Maine lobsterman and indulge in a traditional lobster bake on the shore of the Penobscot Bay. The cruises, round-trip from Portland, Maine, are priced from $3,340 double occupancy. 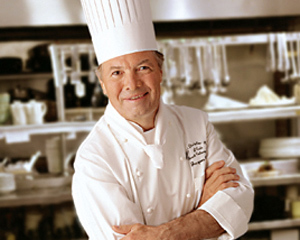 Oceania Cruises justifiably promotes itself as the cruise line for foodies, and on July 23, the Marina will depart with Jacques Pépin, the company’s executive culinary director, onboard. This special voyage will feature signature menus, lectures, culinary demonstrations and more. Fares start at $4,799 per person. Pépin, who has hosted cooking shows on national public television and written more than 20 cookbooks, oversees the onboard bistro that bears his name. The menu features traditional French favorites such as coq au vin, rotisserie-roasted chicken and steak frites. A premium line that focuses on its culinary program, Holland America Line offers a full schedule of guest chefs who lead cooking demonstrations in the ships’ theater or demonstration kitchen. 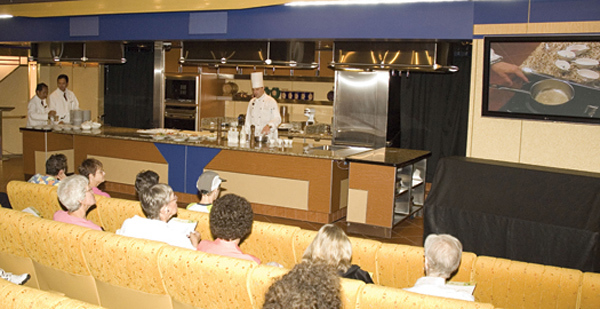 The Culinary Arts Center has a theater-style venue with two large plasma video screens and a large cooking display counter. The founder of the Cheese Education Guild, Guidi will be on the Eurodam’s 10-day Sept. 14 Canada/New England cruise, sharing her 40 years of experience in cheese and dairy. the first full-curriculum cheese appreciation school in North America. Fares start at $1,499. Tabura, who has cooked at many high-end Hawaii resorts, is scheduled to sail on the Westerdam’s Alaska cruise departing Sept. 13; fares start at $749. 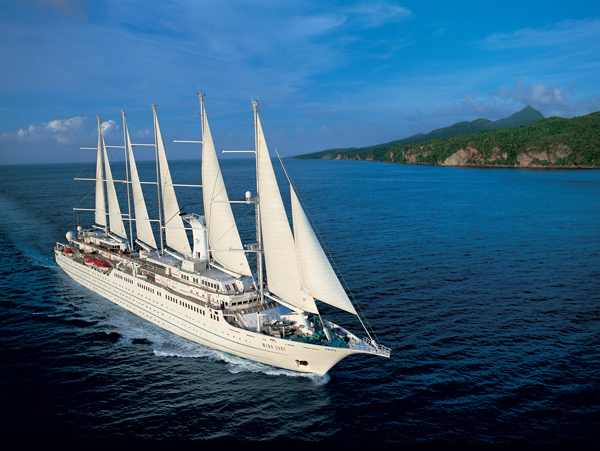 Windstar Cruises’ 310-passenger motor-sail yacht Wind Surf will explore the “Culinary & Wine Delights of Spain” during its eight-day Nov. 15 theme cruise from Barcelona to Lisbon. Onboard will be Stephen Metzler and Almudena de Llaguno, founders of Classical Wines, a Seattle-based importer of Spanish wines. Over 40 special events and activities are planned, including daily wine tastings with cheese or tapas before dinner, two hosted dinners paired with wines, and two complimentary food and wine themed shore excursions. The voyage is priced from $2,999 per person. 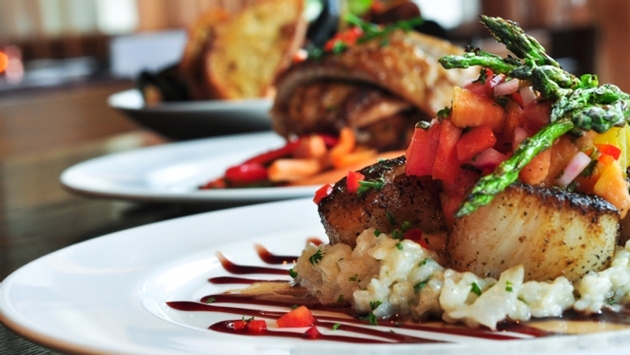 The river cruise line that is part of the Globus family of brands is offering two food-focused departures in France in March 2015 on the Avalon Creativity. They’ll feature cooking demonstrations by an expert chef, onboard tastings, a lecture, a visit to a traditionally run French farm, and explanations of food and wine pairings during dinner. 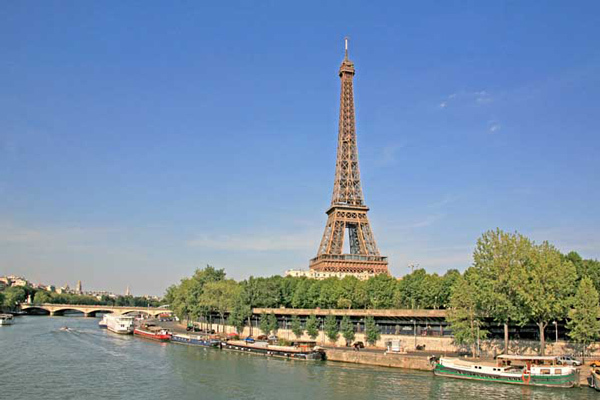 The 16-day “Grand France River Cruise” sails from the Côte d’Azur to Normandy and Paris on March, while an eight-day version departs Paris on March 31.